I took part in the annual Spring Bird Count conducted by the Elizabethton Bird Club on Saturday, May 9. Photo by U.S. Fish & Wildlife Service A close-up shows the facial pattern of an American Kestrel. 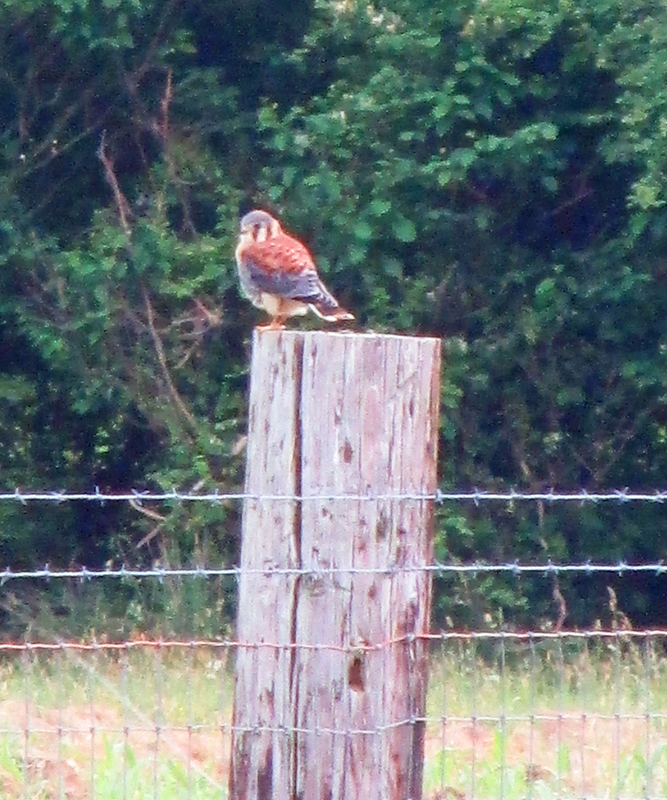 We found a lot of good birds, including an American Kestrel in a field near Sycamore Shoals Hospital. This field has been a reliable location for this small falcon for years. This small falcon, although present throughout the year in the region, is somewhat more prominent during the winter months when kestrels from farther north migrate into the region. However, this falcon also nests in the region and can be found at any time of the year in suitable habitat, which is usually open countryside. The American Kestrel is a small member of the falcon family, which includes such larger relatives as Merlin, Peregrine Falcon and Gyrfalcon. All falcons share a similar aerodynamic design that includes sleek, streamlined bodies and long, slim wings which taper to pointed tips. They fly with rapid wingbeats and are capable of swift flight. Photo by Bryan Stevens An American Kestrel perches on a fence post. 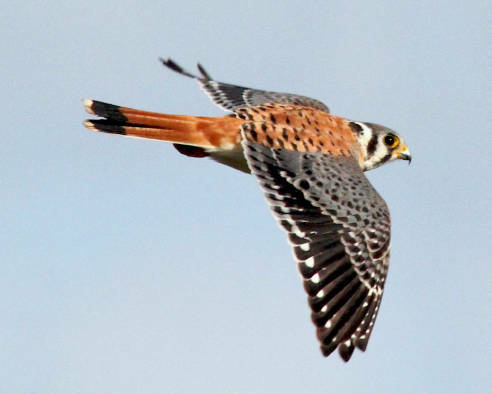 The male American Kestrel is a colorful bird. He shows a rusty back with some black barring, a rusty tail and steel blue-gray wings. The female American Kestrel is brownish with black barring on her back and tail. She also shows a buff-colored wash streaked with brown on her under- parts. Both sexes show a strong facial pattern marked by two black “sideburns” on the side of the face. The American Kestrel has long been one of my favorite raptors. They’re seldom as skittish as many other raptors and will permit close observation. The American Kestrel, formerly known by the name “Sparrow Hawk,” does not feed entirely on other birds. In fact, a large part of this small falcon’s diet includes rodents and insects. 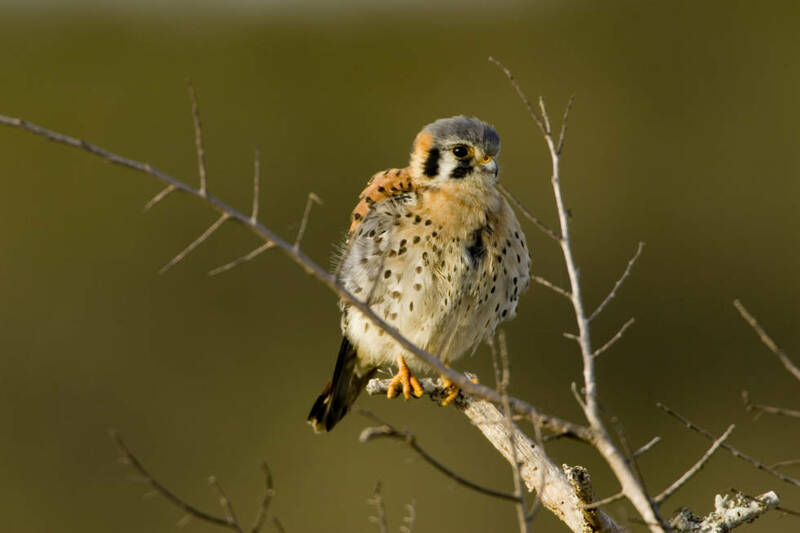 In its nesting preference, the American Kestrel is unusual among other native falcons and hawks. Kestrels nest in cavities, including abandoned woodpecker holes and nest boxes provided by humans. Like many raptors, the American Kestrel likes to hunt from a perch, swooping down on unsuspecting prey. The Kestrel, however, is also capable of hovering, a type of flight that only a relatively few birds, including the Belted Kingfisher and the Ruby-throated Hummingbird, are capable of performing. Photo by U.S. 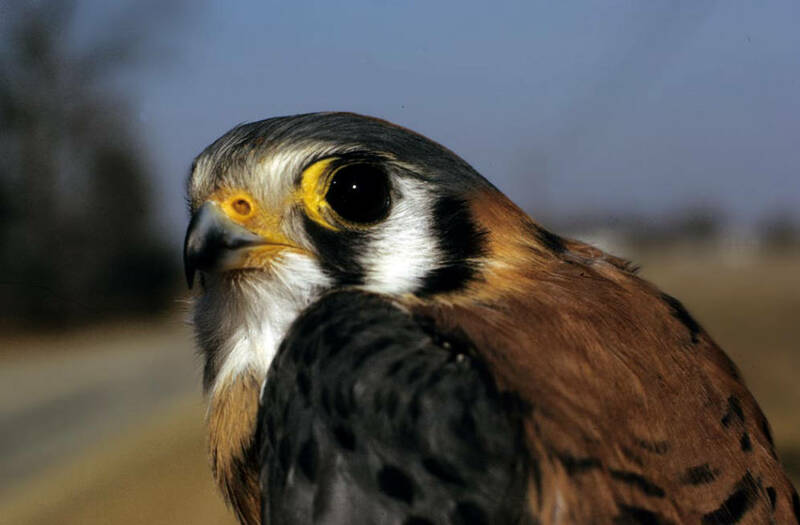 Fish & Wildlife Service American Kestrel shows why falcons are such efficient aerial predators. The falcons comprise a family of birds with a long history with humans. The sport of falconry, although not as widely practiced today, long ago became associated with royalty and nobility. In fact, falconry has been called “the sport of kings.” The sport basically involved hunting prey, usually other birds, with birds of prey such as falcons. As a pastime, falconry never became as popular in the United States as in other parts of the world. There are more than 60 species of falcons found worldwide. While the Peregrine Falcon’s endangered status became well-known in the United States, other falcons have been threatened with extinction. The Mauritius Kestrel once dwindled to a population of only six individuals. Today, the population, due to intensive human effort, has greatly recovered. Photo by U.S. Fish & Wildlife/Steve Hillebrand A perched American Kestrel makes a sharp-eyed survey of its surroundings. Other members of the falcon family can be found in the region, including the Peregrine Falcon and the Merlin. Other falcons in North America include the Prairie Falcon and the Aplomado Falcon. I’ll provide more specific details on the spring count results in upcoming posts. 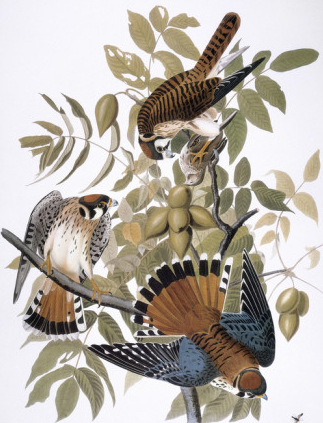 Early naturalist John James Audubon painted this family of American Kestrels. This entry was posted in Uncategorized on May 10, 2015 by Bryan Stevens.